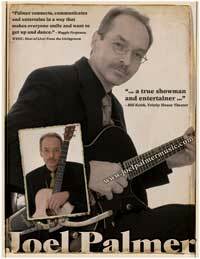 Joel Palmer is a respected Detroit based Singer/Songwriter and guitarist known primarily for his 30’s and 40’s era swing style, with a flair for both blues and folk as well. A trained vocalist, he is able to belt or croon a tune while creating the sound of a small combo with his guitar. Whether performing solo, or in an ensemble of world-class musicians, Joel welcomes the opportunity to perform in a variety of settings. Download his One-sheet for more information or contact Joel at 248-506-1985.